When the scientific revolution in the study of international relations (IR) started in the 1960s, two prominent early pioneers who had particularly lasting impact on the field were Rudolph J. Rummel and J. David Singer. Frank Whelon Wayman, b. 1946, Ph.D. in political science (University of Pennsylvania, 1972), Professor of political science at University of Michigan-Dearborn. Recent co-authored books: Predicting the Future in Science, Economics, and Politics (Elgar, 2014), and Resort to War (CQ Press, 2010). Fields of interest: explanation and prediction of emerging global conditions; war, peace, and security; US national politics, especially public opinion, partisanship and presidential elections, and interest groups and the Congress; Email: fwayman@umich.edu. When the scientific revolution in the study of international relations (IR) started in the 1960s, two prominent early pioneers who had particularly lasting impact on the field were Rudolph J. Rummel and J. David Singer.1 Each led an enormous data project gathering information on sovereign states across the entire world over many decades, up to their time. Rummel’s enterprise was the Dimensionality of Nations (DON) Project, while Singer’s was the Correlates of War (COW) Project. This essay explains how the differences in these two projects have affected the study of world politics down to the present day. If so, in the future, the productivity of the field will depend in part on our understanding of the contrasting views of Rummel and Singer, which continue to affect what we are currently doing, and have implications for what we should do next. To Rummel the regime (and, later, the pairing of regimes, or ‘dyad’) was the place to start in the study of warfare, genocide, and related mass killing, whereas to Singer the central point was the inter-state system in which various regimes (called state system members) were embedded. Rummel’s theoretical orientation, field theory, was similar to Singer’s, general systems theory. Compared to most theories of the time (Dougherty & Pfaltzgraff, 1990), field and systems theory are relatively vague, providing a general orientation rather than predictions. This open architecture was part of the appeal of these frameworks to folks like Singer, who wanted empirically driven results rather than a priori pontification, and to develop datasets that were multi-theoretic in the sense of being able to test warring hypotheses from different contending schools of IR. There are differences between system and field, in that a system has directed relations among its component parts, with feedback (e.g., A attacks B, B defeats A, B changes the system, establishing an international organization to try to prevent attacks; or A attacks B because of a certain systemic power distribution, then war changes the power distribution, affecting the probability of subsequent wars), whereas in field theory there usually is not such a ‘cybernetic’ set of relationships and feedback loops. Instead, in a force field, there can be continuous pair-wise repulsion or attraction. 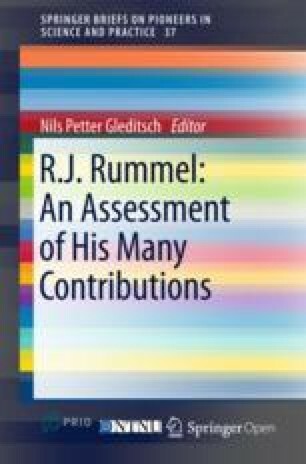 As explained in his five-volume study, Understanding Conflict and War, Rummel (1975) organized his thinking around a certain type of field theory. In practice, fields involve variables whose associations or correlations have an angular expression, which leads to Rummel’s (1970) most widely-cited publication, Applied Factor Analysis, about a statistical tool for determining the number of dimensions in a space we need to study, and telling us the coordinates of the variables and cases in the resulting or ‘reduced’ space. A field can be a geographic grid, such as a farmer’s field or the longitudes and latitudes of Earth; an abstract, mathematical expression of this, such as the Cartesian coordinates; or a force field in such a spatial array, in which forces acting at a distance, such as electromagnetism or gravity, pull objects around. Rummel (1975) distinguishes ‘a region of space’ from ‘the area in which a force operates’, and says the former undergirds spatial theory, the latter, field theory. He is concerned with ‘intentional’ fields that one would find in psychological and social work (the latter including Wright, 1955). This orientation became central to Rummel’s DON project. Rummel earned his Ph.D. at Northwestern University, where he developed DON for his dissertation while under the tutelage of Harold Guetzkow, one of the pioneers in the behavioral revolution in international relations. Guetkow was searching for cross-national data for his Inter-Nation Simulation, and this led him to imagine what became the DON Project. In that crucible, ‘the earliest event-data project of major proportions began in 1962 … [when] Rummel assembled data … originally for use in Harold Guetzkow’s Inter-Nation Simulation’ (Merritt, Muncaster & Zinnes, 1993: 4). By contrast, Singer’s COW Project, launched the next year, was Singer’s own idea from the outset, and as such would become a more central and hence more persistent part of Singer’s professional identity and life work. Foreign conflict behavior is not internally derived. Its genesis lies outside the nation. It is a relational phenomenon depending on the degree of economic, social, and political similarity between nations. … Whether conflict actually occurs depends in part on the social and value distances between the nations. Rummel’s example is dyadic: ‘Even nations that participate very little in the international system may have great conflict with each other if they are contiguous while having a great social and value distance between them (e.g. Israel and Syria)’. Staying this course of looking at dyadic relations, Rummel (1983) eventually published the law that followed from it, the inter-democratic peace. A major supporting idea is the term regime, as operationalized by Rummel (1995) and used as the organizing principle for his datasets on ‘democide—genocide and mass murder’ (Rummel, 1998: 1). This idea of a regime is important to his work because there is a lot of variation from regime to regime in the regime’s amount of power, and also in the number of people the regime kills. And Rummel’s dominant theme is that those two characteristics of a regime (power and deaths) co-vary. In my own ordinary language, a regime is a type of government controlling a state apparatus. As Rummel (1995: 9) says, ‘The changes from the Kaiser monarchy to the Weimar Republic to Hitler’s rule … give us three different German regimes. … I count 432 distinct state regimes during the period from 1900 to 1987’. Hence, there would be the czarist regime in Russia until 1917, and then the communist regime from 1917 to 1991. Between February and October 1917, there should I think be a transition period and transitional regime (under Kerensky). Individual rulers, such as general secretaries Stalin, Khrushchev, and Brezhnev, and their governments, do not represent distinct regimes of their own, but instead are all leaders, successively, of different administrations in the communist regime. To me, Rummel’s (1983) article made the first really convincing case for the inter-liberal or inter-democratic peace. I have since challenged thousands of people, from classrooms to conferences where I am speaking, to name any other proposition in the social sciences that is surprising or counter-intuitive, and that has (according to its advocates at least) no exceptions. No one has ever been able, in my presence, to name such a proposition—other than Rummel’s. The COW Project generated the data for the bulk of the hypothesis tests in IR for decades (Wayman & Singer, 1990: 247–248). And ‘realist theory informed 90% of the hypotheses tested by IR scholars up to the 1970s’ (Walker, 2013: 148). It was a bit of a shock that an anti-realist hypothesis, the inter-democratic peace, had produced such a paradigm-shattering result. Sadly, I never heard Singer say a good word about Rummel’s studies confirming the inter-democratic peace hypothesis. Rummel had used COW data on wars, plus other people’s data on democracy, Liberalism, and freedom of nations, to contradict one of Singer’s claims (namely, Singer’s contention that the inter-democratic peace was based on too few cases and too flawed in other ways to be taken to be true; Small & Singer, 1976). Deciphering Singer’s true position on this is complicated. When Geller & Singer (1998) produced a literature review of scientific studies of international conflict, while they did caution that the evidence is ‘not indisputable’, they did acknowledge that ‘the evidence in the area of the joint freedom proposition is consistent and cumulative. Democratic dyads are less likely to engage in war than are non-democratic pairs’ (Geller & Singer, 1998: 87–88). But on the other hand, on his own at his weekly COW seminar, Singer was much more skeptical about the inter-democratic peace. So it is not surprising that, four years after Geller & Singer’s assessment, one of Singer’s students, Henderson (2002) wrote a book that constituted an attack on the democratic peace literature. In the opening paragraph, Henderson says, ‘It struck me as strange that one of the doyen of the behavioral revolution would be such an avid critic of what some scholars hail as the closest thing to an empirical law in the field’. Instead, Singer seemed more interested in the international or interstate system. While Waltz (1979: 94) defined ‘international political structures in terms of states’, Singer spoke of ‘the national state as level of analysis’ (Singer, 1961: 82–89). Thus, whereas Waltz writes of a system whose basic units are sovereign states, Singer ends up with two systems: an inter-state system and an international system. The international system consists of entities that have an international political goal (including … state creation or survival), engage in international political behavior (including inter-state or extra-state conflict, alliances, trade, or international organizations), or engage in political behavior that has international consequences (such as civil wars). The [international] system … includes … terrorist groups (Sarkees & Wayman, 2010: 27). Much confusion results from the short-hand expressions ‘state’ and ‘system’. ‘Whenever the word “system” was used without a modifier, Singer & Small were referring to the interstate system’ (Sarkees & Wayman, 2010: 16). Likewise, the ‘states’ whose characteristics are listed in the COW datasets are not the population of states, but the population of state system members. Singer’s most widely-cited explanatory articles on interstate war are probably Deutsch & Singer (1964) and Singer, Bremer & Stuckey (1972). Both operate at the system level of analysis. It may be that Singer’s devotion to the interstate system is part of what made him reluctant to embrace the inter-democratic peace. As he said in another widely-cited article, the international system level of analysis ‘almost inevitably requires that we postulate a high degree of uniformity in the foreign policy codes of our national actors’, and ‘the system-oriented approach tends to produce a sort of “black box” or “billiard ball” concept of national actors’. This is consistent with his foreign policy instincts, which were loath to attribute ‘white hats’ to the ‘free world’ and ‘black hats’ to the Soviet Union, in the assigning of blame for the dangers to world peace in the Cold War era. Singer’s posture was very different from Rummel’s, with Rummel in favor of Reagan’s foreign policy and against détente. In these Cold War contexts, Singer may have been uncomfortable with Rummel’s summary that ‘freedom preserves peace and life’. Singer wrote ‘it is evident that my research and teaching has unambiguously been problem-driven’, and ‘for reasons that I struggle to articulate, the problem has been, and remains, that of war’ (Singer, 1990: 2). The COW Project was founded by him at the University of Michigan in 1963, the year after the world nearly was destroyed, had the Cuban Missiles Crisis gone badly. International war attracted Singer’s best efforts at finding the ‘causes of war and conditions of peace’ (1990: 3). As he and Small put it, their focus is a ‘preoccupation with the elimination of international war and the possible role of solid explanatory knowledge in that enterprise’ (Small & Singer, 1982: 17). The first COW war handbook, Wages of War (Singer & Small, 1972) was consequently limited to international wars. Karl Deutsch subsequently convinced Singer that there was a need for a comparable list of civil wars. This led to a new handbook, Resort to Arms: International and Civil Wars, 1816–1980, presenting a ‘comprehensive list that will enhance … study of civil wars’ (Small & Singer, 1982: 204). The civil war list is accompanied with a cautionary note, ‘International war remains our major concern … A research assault on [explanation of] civil war … is clearly a task better left to others’ (Small & Singer, 1982: 17). Consequently, the COW project had many datasets (such as the Militarized Interstate Dispute dataset) on the correlates of interstate war, but nothing comparable on the civil war data. Nevertheless, the publication of the civil war data was a valuable contribution to studies of civil war, and was also a step toward the full delineation of the totality of modern war. This was followed, in the third COW handbook (Sarkees & Wayman, 2010) with a definition and list of non-state wars, completing the full reckoning of the patterns of war in the past two centuries. Also, the focus of Singer on international war was somewhat vindicated by his co-authored article revealing that, over the time since the Congress of Vienna, inter-state wars had resulted in 32 million battle deaths, intra-state wars only 18 million (Sarkees, Wayman & Singer, 2003). Critics often ask if the COW project has a state-centric bias. A more subtle and I think effective line of inquiry is to ask why the COW project has emphasized state-system-membership rather than simple sovereignty and independence as the defining characteristic of the state. This can cause confusion. For example, a number of non-state wars, including the main phase of one of the deadliest wars in history, the Taiping Rebellion, have been fought in areas that would be considered to be states by students of comparative politics. This and other related difficulties have led pioneers outside the COW project (Gleditsch, 2004; Fazal, 2007), as well as Singer’s successor at the COW Project (Bremer & Ghosn, 2003) to propose various revisions and expansions of the concept of the state, to go beyond the COW state membership definition. These difficulties and challenges continue to provide important frontiers for research on war and the state in coming years. In contrast to Singer, Rummel seems to me to have taken a more inductivist, practical approach to states and similar entities. On his website, powerkills.com, one finds a focus on killing, even of one person. The perpetrators are often leaders of totalitarian states, such as Mao, but can also be rebel leaders (the young Mao) or a king (Leopold of Belgium) who controls what some call a colony (the Belgian Congo) but Rummel calls Leopold’s personal property. The unit of analysis becomes the regime and regime-like power-centers such as Leopold’s Congo or Mao’s rebel territory. In no case have I found a democratic government carrying out massacres, genocide and mass executions of its own citizens … Absolutist governments (those that Freedom House would classify as not free) are not only many times deadlier than war, but are themselves the major factor causing war and other forms of violent conflict. They are a major cause of militarism. Indeed, absolutism, not war, is mankind’s deadliest scourge of all. In light of all this, the peaceful, nonviolent fostering of civil liberties and political rights must be made mankind’s highest humanitarian goal … because freedom preserves peace and life (Rummel, 1986). A foundational premise of the COW Project was well expressed by Singer’s student, Paul F Diehl, in the opening line of his Presidential address at ISA: ‘War is the most important subject matter you can study’,2 because of the hundreds of millions dead in modern war and the trillions of dollars spent on the military every year. It was a shock to COW then when Rummel (1986) asserted that, in the catalogue of carnage carried out by modern humans against their own species, war wasn’t the biggest killer. I agree it is more useful than usually realized to emulate Rummel and study both war and the slaughter of the innocents with the totality of such carnage in mind. We certainly could use more work on the regime, a form of government with a temporal extent in-between the long-enduring state and the evanescent individual administration. It would be great to have a Rummel-inspired mutually exclusive and exhaustive list of regimes; and useful to have more refinements of Rummel’s data on regimes and democide. Very constructively, Rolseth, Gleditsch & Theisen (2015) have built a nation-year version of Rummel’s democide data. When Tago and I, in the footsteps of Rummel and Harff, created our own nation-year dataset on wars, genocides, and political characteristics of nations (Wayman & Tago, 2004, 2010), we pored over Rummel’s valuable Statistics of Democide (Rummel, 1998). We have entries from Rummel 1998—e.g., for Japan 1937–45, Japanese war dead 2,521,000 (Rummel, 1998: 39), and 5,964,000 democide (Rummel, 1998: 46–47). We can divide them by the number of years (nine in this case), and arrive at a genocide and mass murder total of 662,667 per year. This would be true of COW data on a war, too—think of World War I—but it is a little trickier for Rummel. These data are often aggregated in Rummel (1998) into totals by regime, and, for instance, the USSR regime lasts from 1917 to the end of his dataset in 1987, and so it is time-consuming at best to break out the effects in different years (how many died, e.g., in 1954?) and by government (e.g., Stalin vs. Khrushchev). One could compare what Tago and I did with the Rolseth, Theisen & Gleditsch data, and then see if the benefits of more refinements would warrant the costs. When the first survey of IR scholars was done by Foreign Policy magazine, to assess who was most influential in their midst (Peterson, Tierney & Maliniak, 2005), Rummel did not make the top twenty-five thinkers; Singer did. Citations to their work produce similar results—Rummel a tad behind Singer. Realism, often claiming separation of domestic and international politics, was the only paradigm with more than one person in that top five. Nothing could be more destructive of this realist claim than Rummel’s work on regimes, which shows that regime type matters (Wayman & Diehl, 1994). It is heartening to me that two people who continued Rummel’s investigation of the inter-democratic peace, Bruce Russett and Michael Doyle, did make the list of the top IR scholars. Apparently, evidence was making some headway in undermining old paradigms. This makes me recall the prediction of Anatol Rapoport, on the trajectory of the COW Project as it was being launched in 1963. Rapoport said to David Singer ‘we were not likely to come up with an integrated explanatory theory of war, … but at least we would lay to rest many of the foolish platitudes that had … led too many nations into the brutal abyss of war’ (Singer paraphrasing Rapoport, in Sarkees & Wayman, 2010: xiii). The progress described in this essay, the progress of Rummel’s doing, was based on the opposite of realism on this point, namely, his insisting on the unity of the study of international and domestic politics, including an examination of the role of regime type in mass violence—both democide and the inter-democratic peace. When he took over from Singer as COW Director, Stuart Bremer convened a conference at Penn State University, on ‘Future Wars and the Future Study of War’. Bremer’s keynote address (Bremer & Ghosn, 2003) focused on whether the COW definition of state was too restrictive, and proposed measuring two dimensions of statehood, autonomy (stamps, money, military forces, autonomous foreign policy, size of territory and of population) and recognition (treaties, diplomatic recognition, participation in international conferences and in IGOs)—more as continuous variables than dichotomies. If done by COW, would this Herculean endeavor not make COW a ‘DON’ project? The non-state wars list of Sarkees & Wayman (2010) has hopefully been a helpful move in expanding our understanding of armed conflict beyond system members, but, just to take one example from that book, a list of all sovereign states would help us divide the newly listed non-state wars into those internal to and those external to a given autonomous state. The 21st century differs from the 20th. There have been no inter-state war onsets since the US invasion of Iraq in 2003. The twelve-year gap is the longest since the 18-year lull of 1828–1846. There are 25 war onsets since the end of 2007, for 3.33 onsets per year. That’s the same pace as in Sarkees & Wayman (2010), which records 3.41 per year. The 25 recent wars are mostly intra-state. Democide is most closely correlated with intra-state war, less associated with extra-state war, and least associated with inter-state war (Wayman & Tago, 2010: 13). So far in the 21st century then, we have intra-state wars, causing great harm to civilian populations. The totalitarianism of the Nazis, Stalin, and Mao largely passed from the scene even before the end of the Cold War. War and death of the innocents continue, but not exactly as in the day of Rummel and Singer. With warfare now more civil, and the civilian deaths less from communist gulags, and more connected to insurgent and counter-guerrilla fighting, it seems that the tide has swung more around to the views of Harff & Gurr (1988) and Harff (2003). Harff warned that ‘geno-politicide’ was continuing at an alarming rate, and was predictable from a set of six variables—e.g., authoritarian regimes, but also civil war and lack of openness to international trade. While it would be great to have Rummel’s democide data updated from 1987 (when he retired it), in the meantime we are well-served by war data and Harff’s geno-politicide data, both of which fit well into the post-Cold-War narrative of civil war and geno-politicide. As one indication of the enduring legacy of Rummel and Singer, in the judgment of Moore (1995), first director of the US Institute of Peace, the greatest advances in the study of war and peace included (1) Wright’s pioneering organization of the field, A Study of War; (2) the project that Wright inspired, COW; (3) the recognition of the human, governmental, and international systemic levels of analysis through the impact of Waltz’s Man, the State, and War; and (4) the discovery of the first powerful and surprising regularity in the field, the proposition of the inter-democratic peace, by Rummel. Shakespeare wrote, ‘The evil that men do lives after them. The good is oft interred with their bones’. Oft interred, but not always. Further good will yet come, I think, from Singer’s and Rummel’s work. I would like to thank Nils Petter Gleditsch for important suggestions improving this chapter. I am also grateful to the two anonymous reviewers for their essential contributions. For a revised version, see Diehl (2016: 1).